Scarce—Many ancient coins are found in hoards, sometimes thousands of pieces. These coins make incredible entry points and inspire even a novice buyer. However, the rarities we offer are rarely found in hoards and are coins that command international attention at every appearance. High Grade—In addition to an overall grade that addresses whether a coin is circulated or uncirculated, ancient coins are graded for their strike and surface condition, which are evaluated on two conditions: 1) How well was it struck? and 2) How well have the surfaces survived the thousands of years since the coin was struck? NGC-certified—When you buy a certified ancient coin, you avoid “problem coins” that were previously mounted in jewelry, repaired, intentionally scratched, or heavily cleaned. Historically Significant—Our strategy has always been to focus on coins struck during the most important historical moments in the Western world. Ancient coins are works of art that bring these moments alive (in precious metal), and just as the most famous Renaissance painters command the highest bid, your coins should appeal to the largest pool of prospective buyers. Our first selection of ancient coins for 2018 meets all of the above requirements, and we are proud to have assembled six tremendous examples of some of the most iconic, world-class rarities in the marketplace. 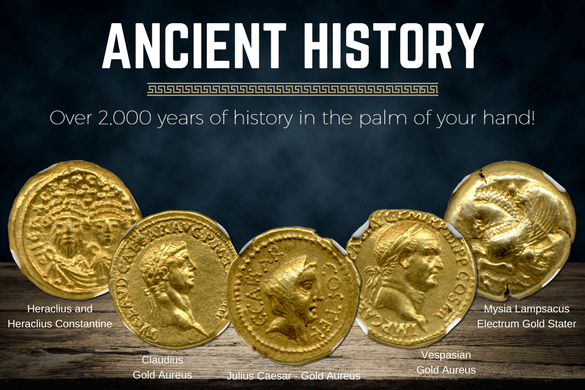 These coins span a period of time from the first gold coins ever minted up to the Byzantine Empire, which began just after the fall of the Roman Empire! To add any of these coins to your portfolio today, please call us at 800-831-0007. Mysia Lampsacus. 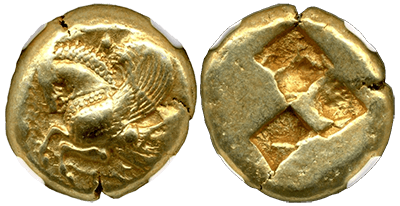 (500-450 BC) Electrum Gold Stater. 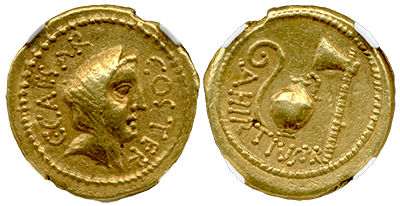 Julius Caesar (d. 44 BC) Gold Aureus. 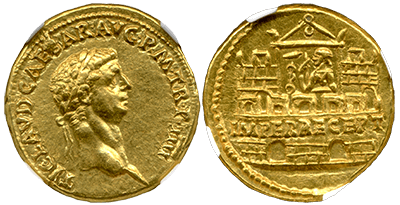 Claudius (AD 41-54) Gold Aureus. 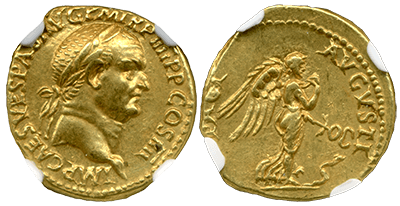 Vespasian (AD 69-79) Gold Aureus. 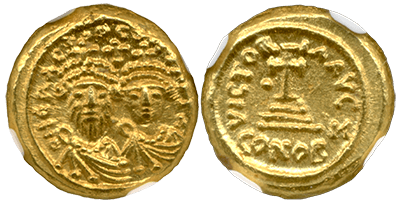 Gold Solidus of Heraclius and Heraclius Constantine (AD 613–641). This selection of ancient coins represents a truly unique sample of rarities available at prices for every investor—whether you’re just getting into ancients, or you’re completing an ancient portfolio. Travel back to the time of Julius Caesar—or to the fall of the Roman Empire to witness the beginning of one of the world’s longest-lived empires—the Byzantine Empire. NGC-certified ancients are holding strong stateside, and we urge you to take advantage of an area of numismatics that is exceeding expectations at auctions and on trading floors across the globe. To add these historically significant, high-grade rarities to your portfolio today, please call us at 800-831-0007 or email us. *Prices subject to change based on market fluctuation and product availability. Prices reflected are for cash, check, or bank wire. Free shipping, handling, and insurance are available. Offer expires Friday, January 26, 2018, or while supplies last.